Among the 20 amino acids that constitute the primary structure of proteins, two, methionine and cysteine, contain a sulphur atom. Because of their interconversions, these two amino acids are usually classified together as sulphur-containing amino acids or sulphur amino acids. Methionine, whose name is derived from its chemical name, 2-amino-4-(methyl-thiol)butyric acid, is nutritionally essential for all animal species. Cysteine, like methionine, is incorporated into proteins based on the genetic code, however, from a nutritional point of view cysteine is classified as conditionally dispensable in most animal species, including pigs (Table 1.1). Cysteine is unstable in solution and is readily oxidized to the dimer form, cystine. Thus when proteins are hydrolysed cystine is produced, with the number of moles of cystine being equal to half the number of moles of cysteine within the protein structure. For this reason, it is cystine that is normally considered in a nutritional context, and the term sulphur amino acids usually means methionine + cystine. Cystine was first isolated from urinary bladder calculi and named from the Greek word (fcysiis), meaning bladder. The structures of methionine and cysteine are illustrated in Fig. 8.1, and the conversion of cysteine into cystine is shown in Fig. 8.2. 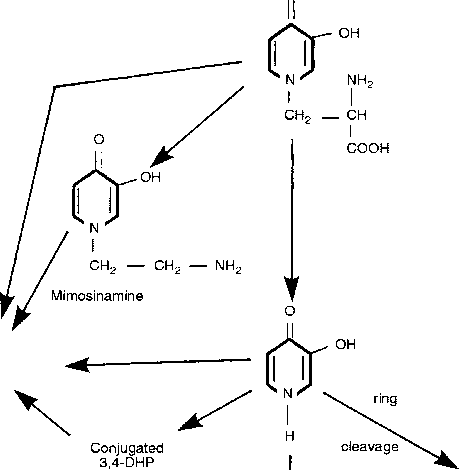 The term 'cysteine' is used to refer to cysteine and/or cystine.